We opened our store on the famous Hwy 76 Strip in Branson, MO, in Spring of 2007. Since then, we have become one of Branson's vacation destinations! Folks come from all over, to see our General Lee and Roscoe Police car, signed by Daisy, Cooter, Cletus and Enos! You'll find these beautiful cars in our parking lot daily! 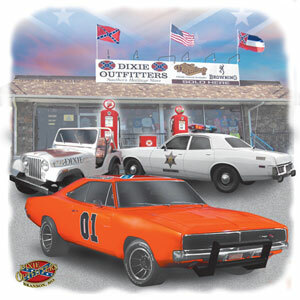 We also carry lots of licensed Dukes of Hazzard merchandise and collectibles. We have all of the over 2,000 Dixie Outfitters t-shirt designs, in stock daily, in sizes 6months to 5X! Come check out the latest designs that are sure to knock your socks off! We also have hundreds of other Confederate merchandise to choose from! You're sure to find your Southern spirit when you walk inside our store! We are proud to be a family owned and operated Dixie Outfitters franchise store and hope you'll come see why folks are calling this, "the GREATEST store in Branson!". Ya'll come see us now!